After 19 years Javier Zanetti has left into legend, front of a full "Meazza" with a standing ovation, the Argentinian played his last match. It ended 4-1, but the result was in the background, Lazio took the lead by goal Bjava, but "Neroazuri" attacked the Romans. Palasio twice Ikardi and Ernanes against former club have brought a convincing triumph for the hosts. But "Meazza" was on its feet in the second half when Zanetti came on, a standing ovation for the man who took part in the biggest successes Inter several years ago, and the club has faithfully served since 1996th when he quietly and without fanfare came from Banfild . "Pupi" is on the end of the match greeted as a hero as he is. In fact, Zanetti will remain at the club, as things are now probably as vice president of the Inter or right hand Erik Thohir. Former team mates, among them the legendary captain of Serbia, Dejan Stankovic were in the stands, "Meazza" to saw off a legend from the field. 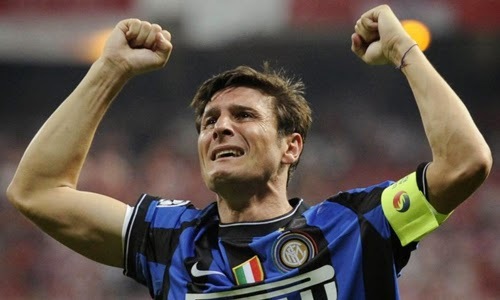 Ciao "Pupi" and a big thank you for all you have given, not only to Inter but also and global football!